Hiya guys! I'm super excited about today's post because this is marking a first for me. 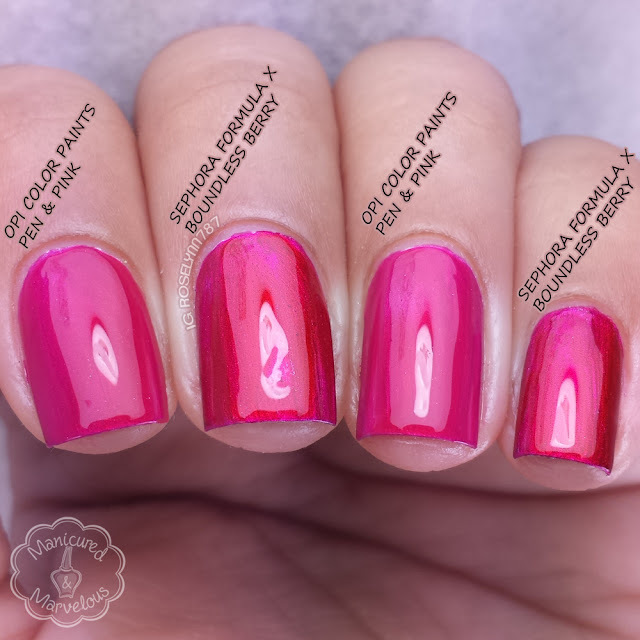 That's right folks even though I have been blogging for almost two years now I have never done a polish comparison post! But ask and you shall receive! 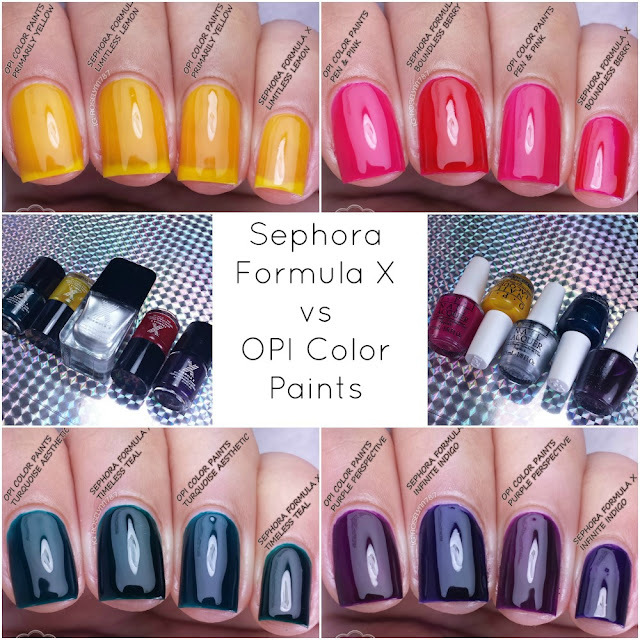 I'm here today popping that cherry and bringing you the long awaited Sephora Formula X Ombre Kit polishes versus the OPI Color Paints! I know a lot of you guys were very curious on how similar these two sets were and I don't blame you. It's undeniable that there are some strong similarities at first glance, but let's take a closer look! OPI Color Paints Pen & Pink is a lot more bright pink toned whereas Sephora Formula X Boundless Berry leans closer to red. The consistency and application are extremely similar however with their smooth finish. Over the silver base the two tones seem to mesh a bit closer on the color scale. OPI Color Paints did not release a spot-on red polish, so in this case I feel like owning both is definitely reasonable. Hmm seeing double much? These are pretty much identical except for when it comes to the application. 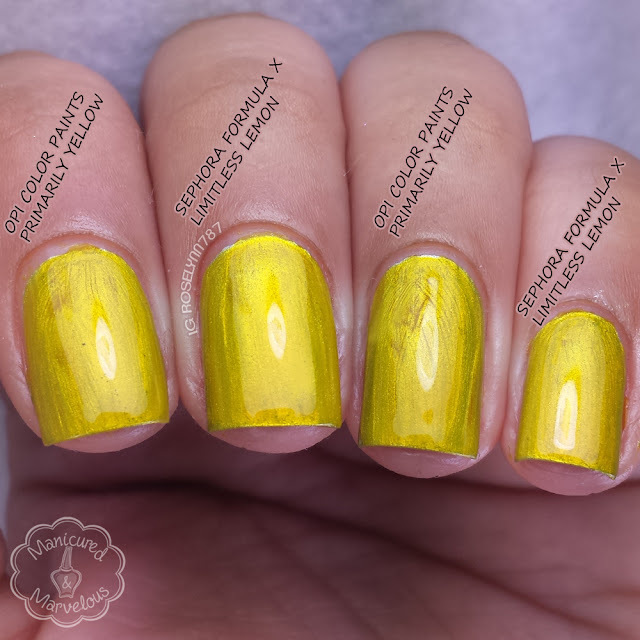 OPI Primarily Yellow has a very patchy formula that ends up being very streaky (you can see this especially over the silver on my ring nail). 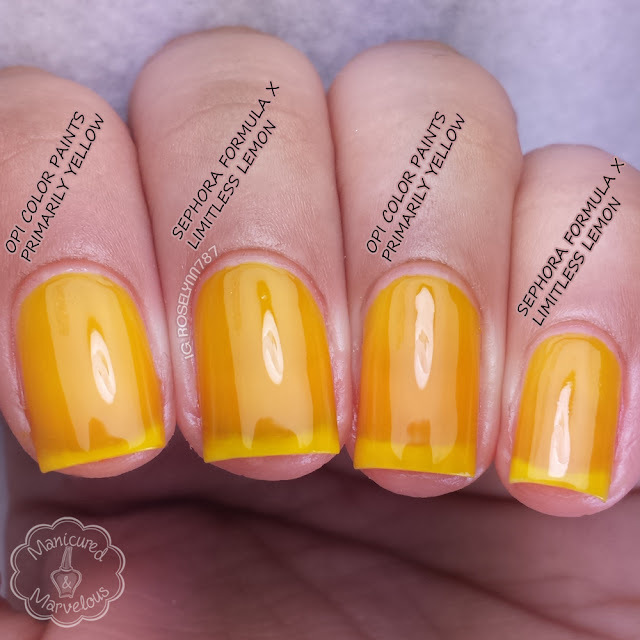 In this case, you clearly don't need both and I have to say Sephora's Limitless Lemon pulls out ahead with its smooth application. Okay so to be fair I don't think this one is as great of a comparison as the rest shown here. 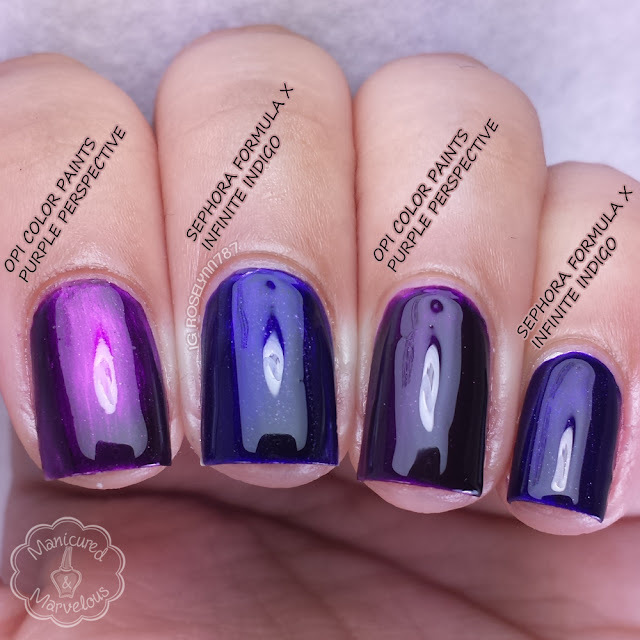 Sephora's Infinite Indigo squares off more evenly versus OPI's Indigo Motif. That being said, Infinite Indigo and Indigo Motif look to be an exact match from what I have seen online. Over the silver base the colors match up a little better, but you can see still a clear difference with one being purple and the other a dark blue. Application wise both are similar and didn't give me any issues for accomplishing a smooth finish. Ah, the one I hate to love... the color that stains. Unfortunately both polishes in their respective collections stain, the Color Paints version is a little less but still a stainer regardless. Without the silver base, the jelly polish ends up looking like an exact copy. Once you apply it over the silver base, however, you'll notice a bit of a color different. The Sephora one, Timeless Teal, ends up finishing off in a darker teal tone. OPI's Turquoise Aesthetic has a brighter more aqua tone. 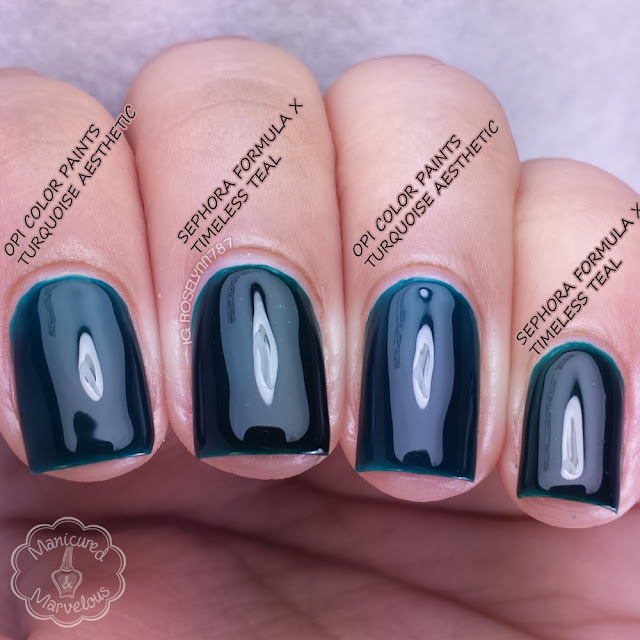 In conclusion, while I can appreciate both the Sephora Formula X Infinite Ombre and the OPI Color Paints Collections respectively I don't see the need for both. The shades are similar enough in color tone that you can comfortably settle for one. Having played around with both sets, I have to say I prefer the OPI Color Paints based on the color tones. The Sephora Formula X set pulls slightly ahead when it comes to formula though! Now in terms of the silver base that both these sets come with. I tend to prefer the one in the OPI Color Paints Collection over the Sephora one. 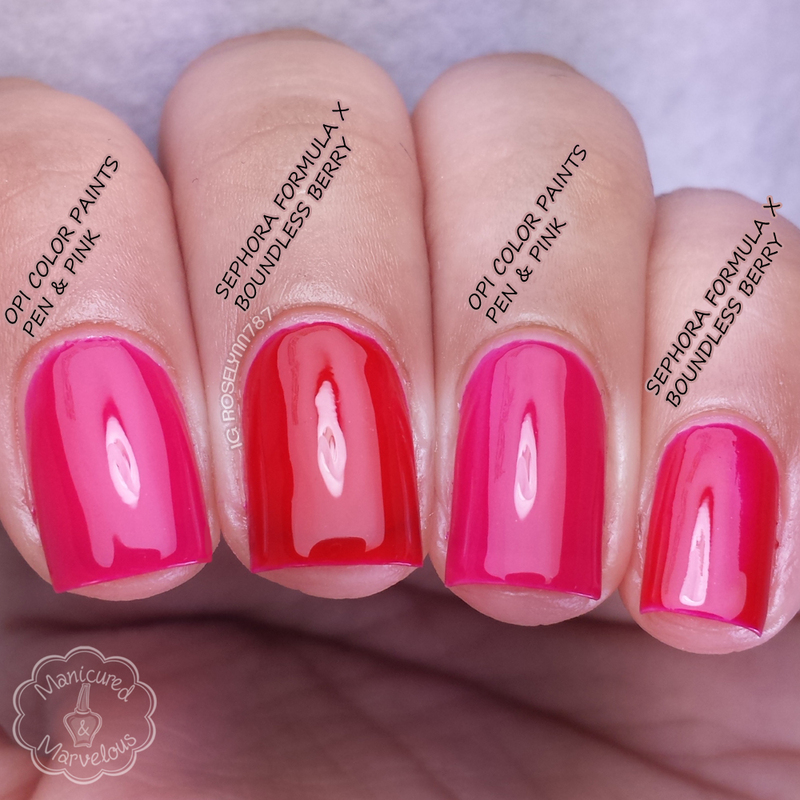 The one that comes in the Sephora Formula X Infinite Ombre kit is very thin and can easily flood the cuticles. 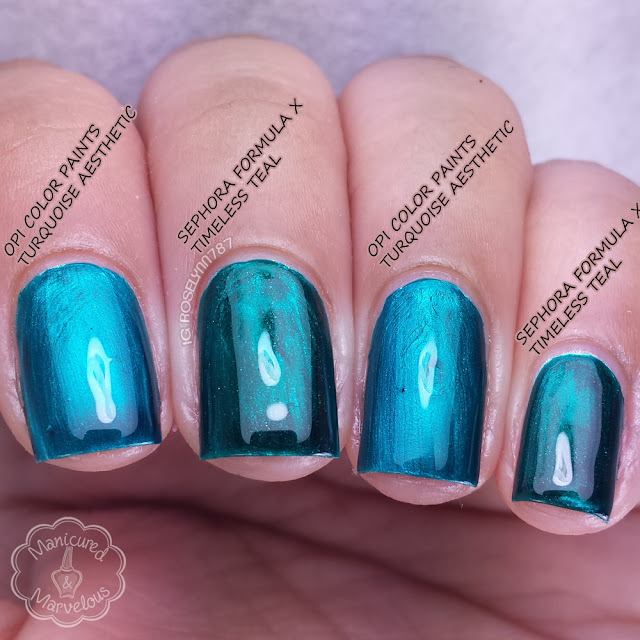 The metallic finish of the polish also causes some very noticeable brush strokes that end up looking uneven. Silver Canvas from OPI has a very controlled consistency and if applied well only really needs one coat. So now that you guys have seen the comparisons, which one do you think you are going to nab? I love comparison posts and this is no exception! I really wish the teal didn't stain - they're so pretty! I also really like Infinite Indigo. I wish so too, the teal was probably my favorite color wise. But knowing how much it stains makes me not want to use it as much. For the sans-silver swatches, how many coats were you using? Great comparison! I didn't realize until this post just how similar the colors were! Ahh, I love this post! Great comparisons! Now, I'm curious how Polish Pusher's Sheer Perfection Collection compares with these two sets. Great comparison post! They're definitely different, other than the yellow of course! Thanks for sharing! Interesting to see different opinions about the formula. My bottle of the yellow OPI has the best formula of the set in my opinion. I found it to be very smooth and not at all streaky. lovely comparison post by the way! Thanks for the comparison post! Still deciding if I will pick up one of these, but if I do I think it will be the OPI. Comparison posts might be my favorite type (oh, who am I kidding, they're all my favorite type). This is super helpful! Plus, I'm not entirely sure I "get" the concept that all these companies are going for with these sets, so I'm happy to see them in action! I love comparison posts and this was fantastic. I've got the OPI set on a wish list. Why oh why can't I have unlimited monies?! haha You definitely need to do more comparisons! I got minis of the OPI's lately. This is so helpful to see how the compare! Great post! What a great comparison post. I was not expecting Sephora X colors to match with OPi color paints but its so sad that they are almost dupes!! This is such a great post! I have the sephora one but I really want the color paints too. I've been debating if I want either of these collections. I think I'll wait to a really good deal or when they make it to the beauty section of Burlington coat factory in a few years. Thanks for the comparison I think I'm going to end up getting the OPI Color Paints. I have the Formula X ones but I kind of like the OPI pink and purple too.